The volume of rows synced per month. For more details please have a look at our Blendo pricing. 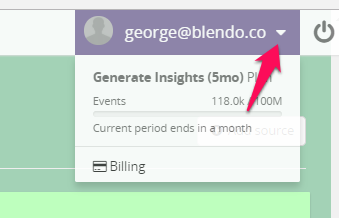 Blendo will also notify you of important events for your billing status. Please read the section Notifications below. For any questions please send us an email or get in touch with our sales team! This volume is very much alike with your 3G data quota of your smartphones. Every pricing plan has a base threshold of replicated rows per month. In case you exceed your monthly row threshold then that is considered an overage. Rows that need to be replicated in full due to the way a data source API works. Some tables may require full replication from the source to ensure accuracy. Rows that need to be replicated in full due to reloading request. 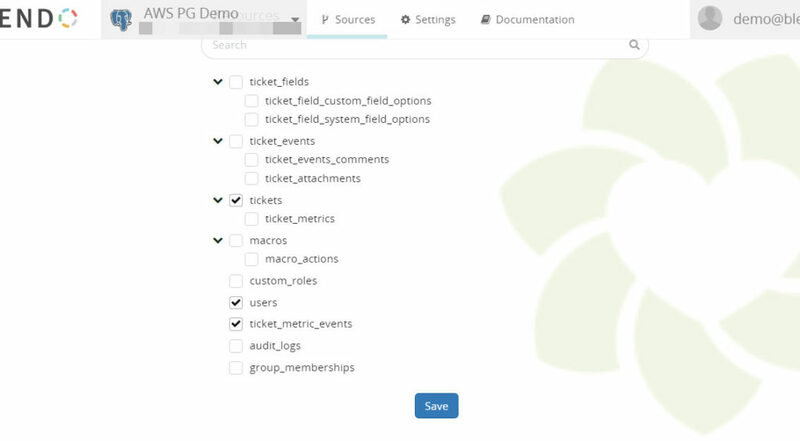 To view your usage and the total number of replicated rows for all of your integrations for the current billing period go to your dashboard. See the number of rows (events) replicated for the billing period. See when your current period ends. It can happen that when you will view the total number of replicated rows, to be higher than perceived that are in your data source or your data warehouse. That is because these are the replicated rows that are required by Blendo to sync so you will have your data complete in your data warehouse. There are data sources with a larger number of syncing tables, with different volume created for each one. The replication frequency of your data source is set to 15 minutes. Updated rows, nested data, copies of existing rows are counted towards your total replicated rows. Every plan has limits on what and how much you can sync. If you exceed your monthly row quota, an overage fee will be applied as an extra charge in your next month’s invoice. When you approach the monthly sync limit on your plan at 80% we’ll send you an alert. When you reach 100% of your monthly plan’s usage will also get another alert. From now on any data synced is considered as overage. When you reach 200% of your monthly plan’s usage and in order to prevent excessive overage bills, your pipelines are paused temporarily. The notification will ask either to unpause and continue overage charging or upgrade to a higher plan. You can learn more about the limits of your current plan, and the limits of other available plans, on our pricing page. Please note: These email notifications come from billing@blendo.co. To make sure you do not miss such important information please add billing@blendo.co to your address book or whitelist us. This is also important for the Gmail/G-Suite users in order not to end up in the Promotions/Updates folders. Our default Replication Frequency is 1 hour. You may change it to daily. You may select to sync only the resources and tables you actually need. Right after validating with one of the data sources you will get an option to select the resources you want Blendo to replicate. Tick all those you need and click save. At Blendo we use incremental replication for our data sources but sometimes the volume can vary. There are data sources that create a huge volume of data with many custom fields. In addition, there are resources with nested data that could impact your row count. Last but not least there are data sources that we pull data in a time windows.